Welcome to Shield Marquee Mnaufacturing Ltd. Marquee manufacturing company from Birmingham. Local, great prices and great customer service - get a quote from Shield today, both custom or standard. We are a marquee manufacturing company based in Birmingham, UK. As a marquee manufacturer, we offer a range of compatible frame marquees, temporary structures and marquee components. We also manufacture compatible marquee roofs, walls, windows, gables, plus many more items - see how we can help you. Why not buy your structure from a marquee manufacturer based right in the heart of England? 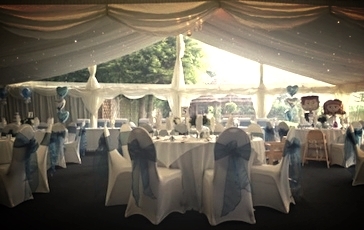 We build the best marquees - to ensure that all your marquee needs are satisfied professionally. Our equipment will be a reliable asset to your business - designed to withstand the rigid requirements of the marquee hire industry. We offer a fully featured range of products and services - from standard clear span structures to full custom marquees. It could not be easier: if you would like to buy a marquee, contact one of our marquee sales team and we can discuss the options with you. Shield's Components Stand at the Showman's Show 2016. With Shield, you can be sure you will get the best in class equipment, made of the best materials by enthusiastic staff and tested by people with more than a decade of experience in the marquee manufacturing industry.